From left to right, Marquise Bradford, Jerrick Fayne, Deshawn Smith, and Shamar Turner hold up exclusive hand sign as new brothers. 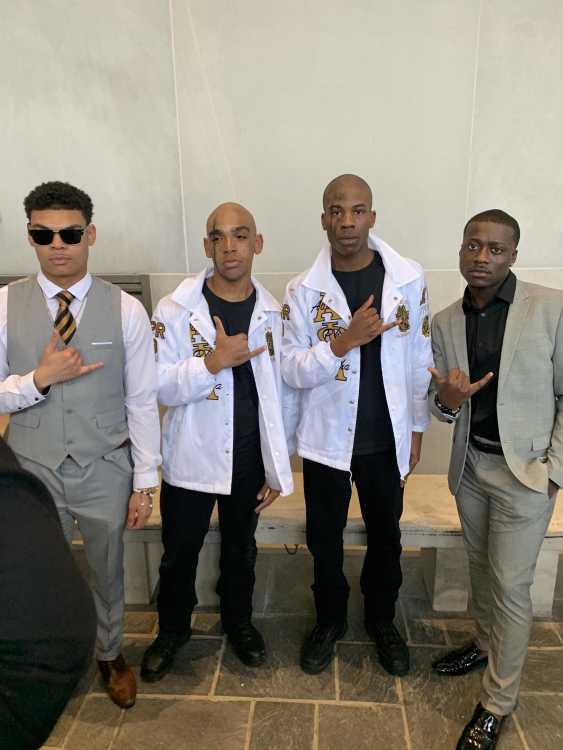 Southeast’s Xi Gamma chapter of Alpha Phi Alpha Fraternity Inc. hosts its first probate of the semester in celebration of two new initiates March 30. Southeast students Jerrick Fayne and Deshawn Smith were celebrated at a special ceremony they call a Neophyte Presentation, or for shorter terms, a probate. 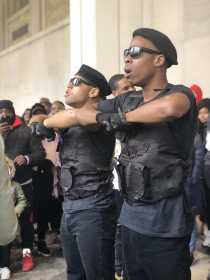 Alpha Phi Alpha Fraternity, Inc. newest members Jerrick Fayne (left) and Deshawn Smith (right). These presentations are known to get the African American community together as one, feed their curiosity, support new and old members. “I’m going to the probate to support the Alphas and support African Americans. It’s nice to see what all they have accomplished,” Southeast student Kayla Booker said. President of Southeast’s NPHC and member of Delta Sigma Theta Sorority Incorporated Jaleea Hudson-Wilson shared another reason why supporters are eager to witness events such as this. 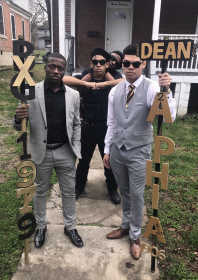 Shamar Turner (left) Jerrick Fayne (middle) Deshawn Smith(back) Marquise Bradford (right) posed for a photo before they made their way to the probate. “Being able to have and showcase the new members of the organization to the campus for the first time makes it exciting to watch,” Hudson-Wilson said. The two initiates gave a powerful presentation, sharing songs and history about their organization. Nearly 100 supporters surrounded the two to witness the event. President of Alpha Phi Alpha, Shamar Turner shared the impact of this organization’s celebration. Vice president Marquise Bradford shared one of the important reasons of having a Neophyte presentation from a member’s perspective. “It is important to present the new members of the organization along with displaying the knowledge learned. It’s a celebration and brings the organizations of the Divine Nine together,” Bradford said. After the presentation, family members, friends and fraternity brothers took pictures and presented gifts to the new initiates. The new members had nothing less of smiles on their faces and expressed their anxiousness in starting their new journey. “I feel thankful to be a part of Alpha Phi Alpha. I look forward to holding up the quality of the brotherhood and being a great model in my community,” Fayne said. Smith also gave a few words on how he felt about his new membership. “It’s kind of surreal. I have been wanting to do this for a long time,” Smith said. The Xi Gamma Chapter was chartered March 17,1979 at Southeast. Alpha Phi Alpha Fraternity Inc. is part of the National Pan-Hellenic Council (NPHC) or in other words, the Divine 9. The Xi Gamma Chapter was chartered March 17,1979 at Southeast.